Sailing vessel Dunnottar Castle, wrecked at Kure Atoll in 1886. Credit: San Francisco History Center, San Francisco Public Library). 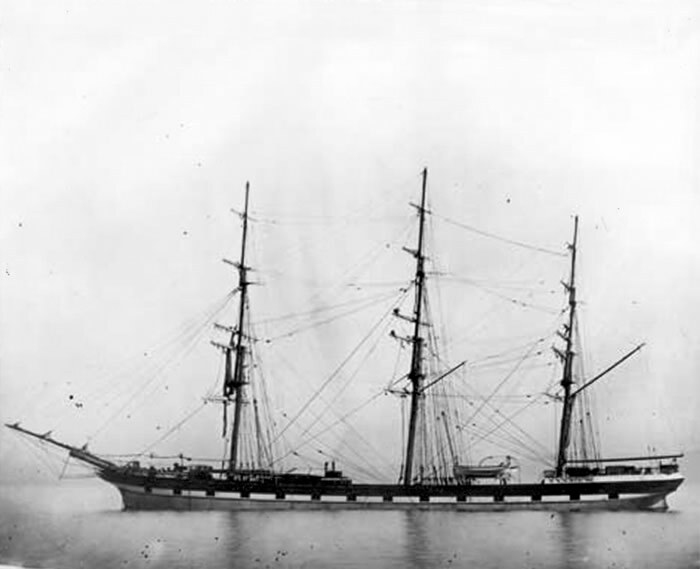 The three-masted 258-foot British iron-hulled ship Dunnottar Castle was built in Glasgow, Scotland in 1874. 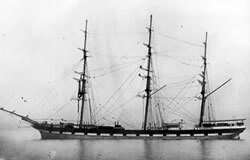 She was lost at Kure Atoll on July 15th, 1886 while bound for Wilmington, California from Sydney, Australia with a cargo of coal. A malfunctioning chronometer put the ship off course and onto the reef. Though efforts were made to jettison the cargo and repair the damaged hull, the stricken vessel could not be refloated, and the crew abandoned ship for the nearby deserted island. The castaways would have to take charge of their own rescue. After abandoning the ship, the chief officer and six seamen took one of the boats and made a 52-day passage to Kauaʻi. While they were gone, the majority of the 28-man crew were rescued from the island by the ship Birnam Wood and deposited in Valparaiso, Chile. Meanwhile, the steamer Waialeale was jointly chartered by the British commissioner in Honolulu and by the Kingdom of Hawaii and sent on a (now redundant) emergency mission to the distant atoll. Only the three dogs which had been left behind, two terriers and a retriever, were there to be rescued. There was more to this trip, however. Hawaiian officials, suspecting that the British might use the occasion to annex the island, shared the expedition expenses and instructed Commissioner James Boyde to take formal possession of Kure Island. Subsequently, a "life protection station" was constructed at Kure for the benefit of future castaways. This station included emergency water tanks, a small house with a rainwater drainage system, and coconut trees. 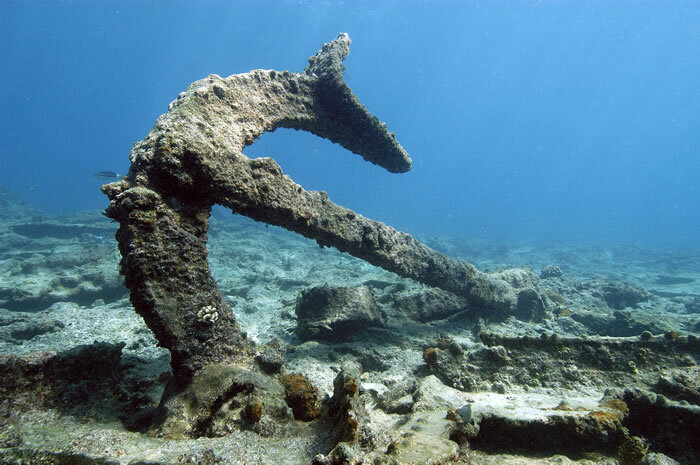 Thus, the wreck of the Dunnottar Castle precipitated the Kingdom of Hawaiʻi's official presence at Kure Atoll, our most remote coral atoll at the northwestern extreme end of the entire archipelago. Brenda Altmeier swims above the wreckage of the Dunnottar Castle. Credit: NOAA/Schwemmer. The Kure Atoll refuge staff (State of Hawaiʻi Division of Forestry and Wildlife) came across the wreckage by accident while transiting through the lagoon. 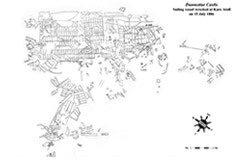 Atoll staff radioed the NOAA archaeologists who were surveying two other locations at Kure (The New Bedford whaler Parker and the USS Saginaw), and a preliminary survey was initiated. The Dunnottar Castle lies adjacent to a shoal area in the vicinity of the atoll reef, accessible only in calm weather. There can be a distinct thermocline at this location, and the mixing of colder and warmer waters can produce a shimmering effect which detracts from optimum visibility. Coral cover is minimal on the site, but large numbers of fish find safe habitat among the wreckage. The site is alive with the snap, crackle, and pop sounds of shrimp and bi-valves. 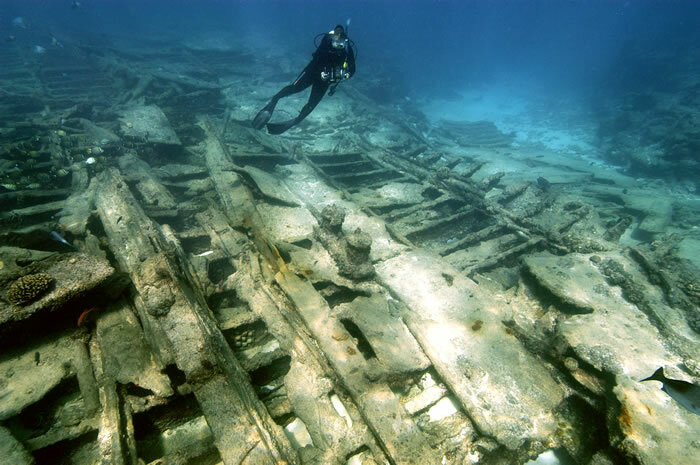 The initial dive in 2006 revealed the flattened and broken but nearly complete remains of a late 19th-century tall sailing ship with iron hull and steel yards and masts. Many of the wooden components, loose materials, and organic fabrics have been swept away, but the heavier elements remain. Large sections of iron hull plate, iron frames, rigging, masts, auxiliary steam boiler, keelson, anchors, windlasses, winches, capstans, davits, rudder and steering gear, cargo hatches, bow sprit, hawse pipes, chain locker, ballast stone, deadeyes, chains, stringers, bitts, ladders etc. are fixed in place on the sea bottom. No small or movable artifacts were encountered. 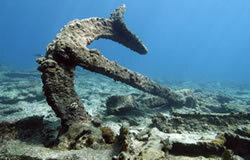 Diving the site can be disorienting, for the iron and steel components seem to stretch endlessly across the seafloor. Trotman anchor at the Dunnottar Castle shipwreck site. Credit: NOAA/Schwemmer. The site is approximately 250 feet in length, corresponding to the ship's original size. The industrial nature of the artifacts and the general lack of coral cover makes the location well-suited for standing up to the power of the winter storms and seas which pound the atoll. The wreck of the Dunnottar Castle is a nearly complete assemblage of a late 19th century commercial carrier, an incredible heritage resource from the days of the sailing ships like the Falls of Clyde (Hawaii Maritime Center), Balcalutha (San Francisco Maritime Park), and Star of India (San Diego Maritime Museum) when our maritime commerce was driven by steel masts and canvas, wind power, and human hands. Are we only now rediscovering this source of clean energy? Perhaps that's one of the larger lessons from the Dunnottar Castle site. 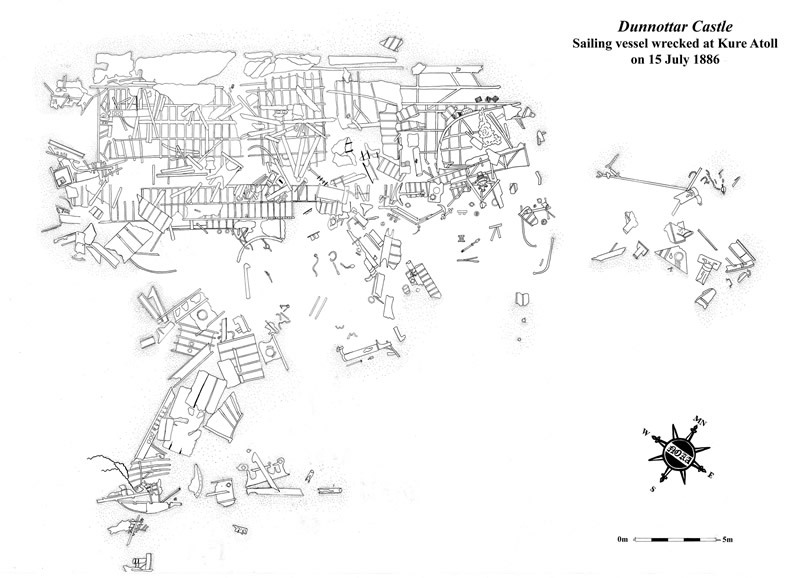 PRELIMINARY site plan of Dunnottar Castle shipwreck begun in 2008 (not complete). 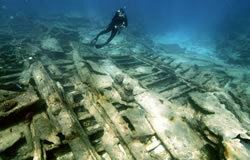 In 2008, a team of NOAA maritime archaeologists returned to the site to complete a survey of this massive shipwreck and collect more photographs and high definition video footage. Because of the enormous area of the wreck scatter and the limited time at the site, the site plan will be completed in subsequent years of survey. Below is what we consider a preliminary site plan for understanding of the scatter. A final site plan will be posted as soon as it is complete.